Forum Index > Off-topic Talk > Concave Edged Swords... Fact or Fiction? Posted: Fri 28 Dec, 2012 6:48 pm Post subject: Concave Edged Swords... Fact or Fiction? Over the past four years I have been working on a fantasy based story idea, with unique cultures and characters. One of the 13 main characters hails from a city where mastering one of three types of sword is considered a worthy deed. In order to add depth to the story I have written (into my outline) a few details about these martial schools with descriptions of the swords used. This character is exceptional in his skills as he has mastered two of these arts, in a fraction of the time some take to master even one, plus he has a psychic ability to view his complete surroundings in every direction. This ambitious endeavor may have been as a means to boast, because this sword master almost solely uses the sword he was originally trained with. The sword in question has a long two handed grip similar to a traditional katana, if not slightly longer. The cross guard only extends about two inches on the side of the blade that is sharpened. The blade itself is approximately 3ft long, curved, and with a concave cutting edge. The edge does not become convex for any portion of the cutting edge, even to the tip I have the blade geometry draw out in specifics, but will not go into much more detail here. distal taper blah blah blah. All of this imagining made me begin to wonder if ever such a sword existed in our own history. I have seen reproduction concave edged "katana", if they could be called katana. They are marketed as "reverse curve katana". I have not been able to identify anything of repute that would suggest any such a weapon has ever existed other than of a reproduction / fantasy nature. I have read a short answer on a question board somewhere out there in internet land stating that concave edged swords did exist in Japan, but that they predated the sword we commonly refer to as a katana. I have heard claims that a sword of this nature has better aerodynamic qualities, and thus allows for enhanced ease of swinging. If this aerodynamic statement were true, then the major downfall to such a sword would be the obvious ability to draw the weapon and produce a cut with the same motion as was developed in later evolutions of Japanese sword art. Now, before we veer off track and begin talking about the sica, falx or rhomphaia, I would like to mention that I am already aware of these weapons / farming implements used in past times by peoples like the Dacians. This inquiry was more specifically focused on determining if any other convex edges weapons actually did exist. I would also like to mention that this does not include a falcata or kopis, as they only have a portion of their edge side that is convex, and I would even venture a guess that it was largely not sharpened. Correct me on the falcata / kopis edge comment, if i am not correct. So, what do you think? Fact or fiction? If you know of a historical example of a sword that has a convex edge, please share that information here. I would also like to hear some thoughts concerning the use, and potential effectiveness of such a blade. If this type of blade is effective, then why have their not been more examples of them historically? I am a believer that history tells us what works, and what doesn't. So what are the thoughts as to why concave edged weapons were not commonly used, manufactured, or effective. Could it have been because concave edges are harder to sharpen, or smith? Just an uneducated thought. What do you think? Concave all the way to tip is common enough on a lot of farm/forestry tools (sickles, bills, slashers, pruners, debarkers). Many have been used as weapons, and some have become specialised weapons. But not many could be called swords. For weaponised things of this kind, knives and polearms are more common. Why? Single-edged and concave edge all the way to the tip isn't good for thrusting. Concave near the grip and convex near the tip gives a good thrusting point, with the concave part of the curve giving a good "pistol grip" style grip for thrusting. (As we see on swords such as yataghans (and yataghan bayonets), kukri, sosun patta, and more. I think that the lack of thrusting is why we don't see more purely-concave swords. The forward curve can make it harder to get edge alignment correct when hitting. It can make it harder, or impossible, to draw cut, which means you can end up with the sword stuck after a blow. These will be as bad, or worse, for an all-concave blade compared with the usual concave-convex blades. If you don't get the benefit of good ergonomic thrusting in return, it might make for a poor weapon. - the shotel is an extreme case of a concave-edged sword: http://en.wikipedia.org/wiki/Shotel These are usually double-edged, so they don't fit your criteria. The curvature gives it the ability to reach around a shield. I don't think the aerodynamics would be any better; worse seems more likely since poor edge alignment will tend to become worse during a swing. I don't think this would matter much. Thanks for the reply Timo! I was aware of the ginunting, but had not heard of some of these other varieties. It seems to me that a number of these are listed as being sacrificial. I would think that sacrificial weapons would be chosen for potentially having great cutting power. I am aware that a katana, could be used in the thrust, but is this a common technique? How common is a thrusting technique in traditional katana sword play. I have yet to see anyone stabbing tatami mats. Much like the sword in my story, I would think this sword would be specialized in devastating cuts. I would still like to confirm the existence of a Japanese sword that predated the katana, and had a concave cutting edge. One place I had read called this sword a kutto, or futsunomitama-no-tsurugi. This is said to be the most ancient type of Japanese sword, and is surrounded by great legend. Something about it having united the Japanese people. Does anyone have a good source documenting this type of sword? Essentially, the "reverse blade katana" is a modern creation. I'm not aware of any full-size concave-edge Japanese swords. There is a Japanese concave-edge knife, which might be what "kutto" refers to; biggest I've seen a picture of was either large tanto or small wakizashi size. Can't locate any further information on it. Not a significant weapon; various sickles and pruning hooks saw much more use as weapons. Pre-tachi/katana swords were straight, either single-edged, or double-edged. The single edged ones were pretty much like Chinese and Korean swords of the time (the Chinese ones are usually called Tang Dao, after the dynasty, Japanese ones chokuto). I don't know of any photos of Futsunomitama-no-tsurugi, which is a sword enshrined in Kashima Shrine (there's a shrine to the sword itself elsewhere, but the sword isn't in it's "own" shrine). It's not kept in view (in common with a lot of similar relics). It seems to be an immensely long Tang dao/chokuto, well over 2m long. It's possible that the straight edge is slightly concave from mis-judged heat treatment or over-polishing, which might be why some websites says it's concave edged, but it's basically a straight sword. It won't have enough curvature to make any practical difference. From the length, it doesn't seem to be a practical weapon. There are other similar weapons out there that have survived; they seem to be ceremonial pieces. I didn't mention the various European examples in my last reply. On many of them, the edge is in two sections, both of them concave, joined at an angle. There are Maciejowski Bible falchions/choppers like this, and "reverse edged" falchions. See http://www.myArmoury.com/talk/viewtopic.php?t=13109 for some pictures. Some of these have reasonably good thrusting points. Thrusting is pretty common in Japanese sword arts. There are thrusts in koryu kata, they allow thrusts in kendo. For sacrificial swords, there's usually no need for thrusting, and you are likely to want to chop through, not draw cut without going all the way through, so concave edge is good for this. Posted: Wed 10 Feb, 2016 5:13 am Post subject: Re: Concave Edged Swords... Fact or Fiction? If you know of a historical example of a sword that has a convex edge, please share that information here. I would also like to hear some thoughts concerning the use, and potential effectiveness of such a blade. If this type of blade is effective, then why have their not been more examples of them historically? I am a believer that history tells us what works, and what doesn't. So what are the thoughts as to why concave edged weapons were not commonly used, manufactured, or effective. Could it have been because concave edges are harder to sharpen, or smith? Just an uneducated thought. What do you think? Better late than never.....there is another type of a concave sword that I have become aware of, it is a form of Ottoman yatagan, and while most yatagan are thought of as short swords or large knives, these particular ones are true swords. They are shown in period photographs being worn by Zeybeks (Zeibek / Ziebak). 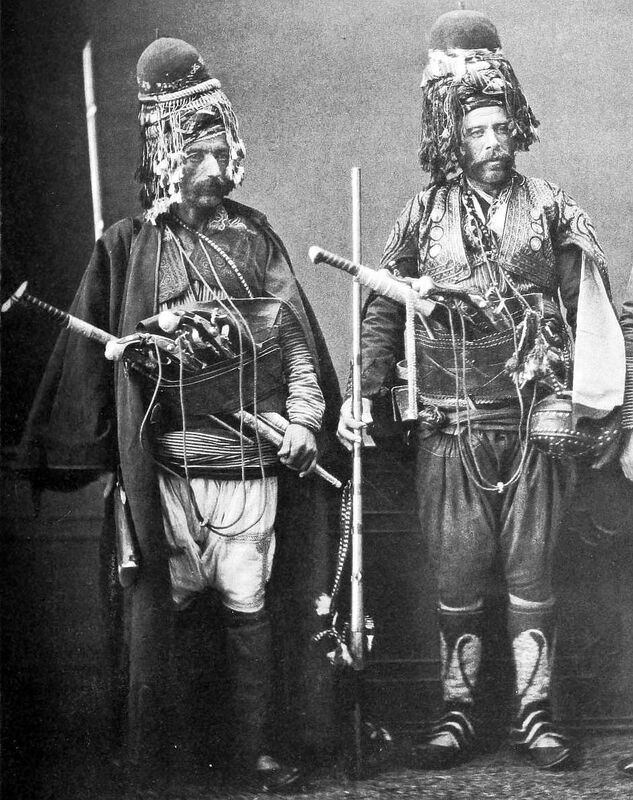 Zeybeks were irregular militia and guerrilla fighters living in the Aegean Region of the Ottoman Empire from late 17th to early 20th centuries. 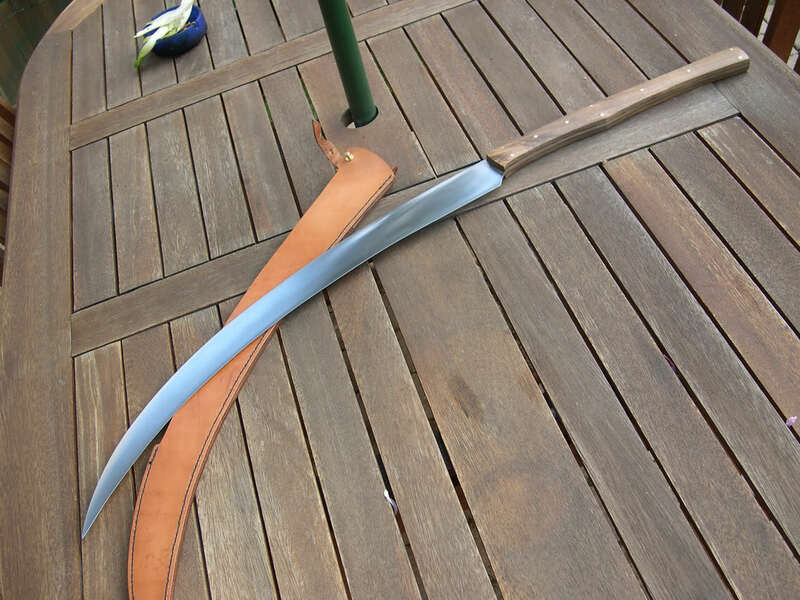 These very long yatagan usually have a T handle and the blades do not have a belly or recurve. 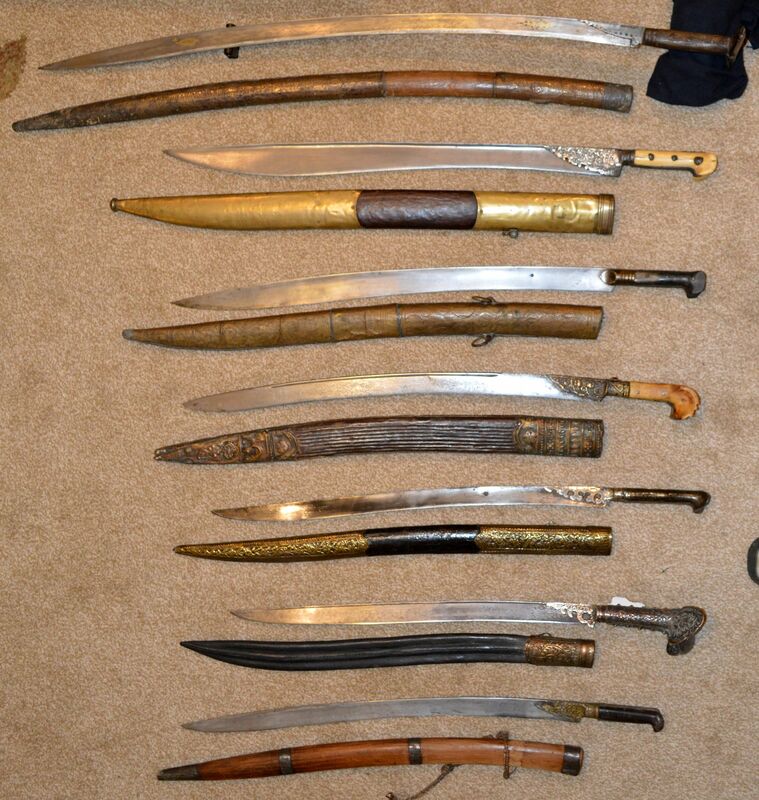 I can not find any information on how these swords were used, I have never seen any indication that Zeybeks were mounted so I have no idea what there purpose was. This is the longest example I know of, with a typical T shaped hilt, pattern welded (damascus) blade known as "Turkish Ribbon", were bands of twisted steel ingots are forge welded between a high carbon steel edge and the spine, extremely long (34 inch/86.6cm cutting edge), 40 inch (101.6cm) total length. Length 35 inches or 89cm, blade length 29 inches or 74 cm. You can see the size difference in this comparison, the smallest yatagan in this group has a 20 inch blade. Ottoman Zeybecks with large T handle yatagans. Should you be interested in Eric's comments on the yagatan, you can try searching for "yagatana" on YouTube. I recall watching someone make a custom sword which may be along the lines of the weapon you have in mind. A historical basis is always wonderful to have when making fiction feel real, but so long as the mind can be made to feel that the idea in question is reasonable, you can do just about anything. Shoot, just read one of Frank Herbert's novels! Best of luck with your literature! Wikipedia has a page for "scythe sword". Came across it last year but could never find any other info about it. This sword in a Dresden museum seems to be the only known surviving example of a true scythe sword, i.e. a sword with a blade made from a real scythe and not just a sword with a scythe shape. The incisions on the blade represent a runic calendar. It may be the sword Thomas Müntzer, an early Reformation-era German theologian, who became a rebel leader during the Peasants' War. In the Battle of Frankenhausen, Müntzer and his farmers were defeated. He was captured, tortured and decapitated in 1525. In closing, as it is now, you could find a way to use that sword in combat, though I don't think it would get you very far. If it's a genuine representation of what the peasants were using, no wonder they lost! Whatever it is, this was originally a farm tool and not a sword. Michael Beeching, I was thinking the exact same thing regarding the grip and chain. Could be a late addition, since the leader of a peasant's rebellion probably wouldn't have had that bling, especially if he lost. Great find Eric S, really neat picture anyhow! Posted: Mon 15 Feb, 2016 4:29 am Post subject: Concave Edged Swords... Fact or Fiction? Sometimes it feels like impossible for swords to have concave blades. That's quite long and heavy, though.